It is starting to feel like “Fall” around these parts. Thank you 80 degrees with a breeze. Honestly, I’d prefer some sweater weather, but I can’t complain. This past few weeks we’ve been all about the season, Fall and a little turkey persuasive writing. This time of year I love doing a little Fall Thematic unit! I feel like I have to teach about fall here in the Sunshine State. Mainly because there really isn’t a Fall season. Unfortunately, the palm trees don’t really loose their leaves and animals head our way for winter… so teaching about this “abstract” idea is a must! “Why do the Leaves Change Color”. If you’re not familiar with this amazing website, I seriously suggest you check it out! They have THOUSANDS of books to choose from all leveled and perfect for putting text in our student’s hands. Reading out loud to students can only do so much. We gotta practice those skills too and this website helps me do that! So the first day we read our non-fiction text, we focused on the text structure and text features. 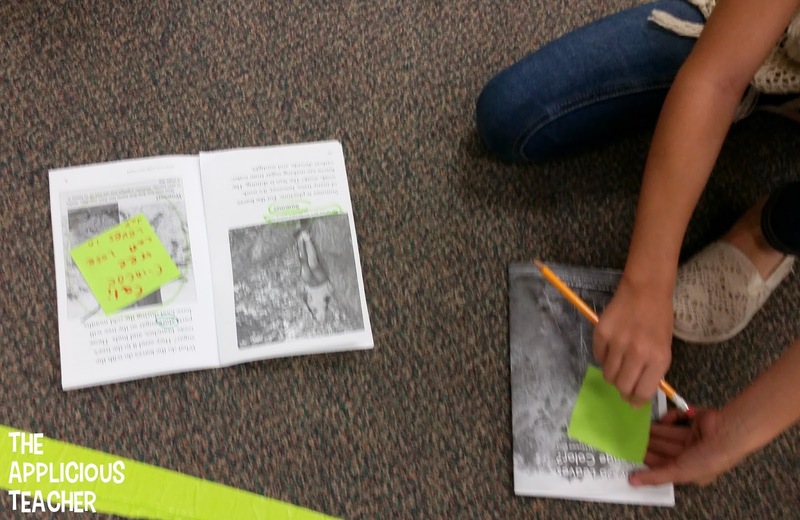 Text features is an area of weakness for my kiddos this year, so we talked about them- A LOT! LOL! Before even reading the book, we went on a “Text Feature” hunt and circled all the text features we could find using a marker. Our second read focused more on the main idea of the text. What was this whole thing about? We used the Main Ideas and Details Interactive Anchor chart to show our findings. Then, I gave each pair of students a sticky note to find evidence to support our claim. I’m not gonna lie, folks… this was a challenge! 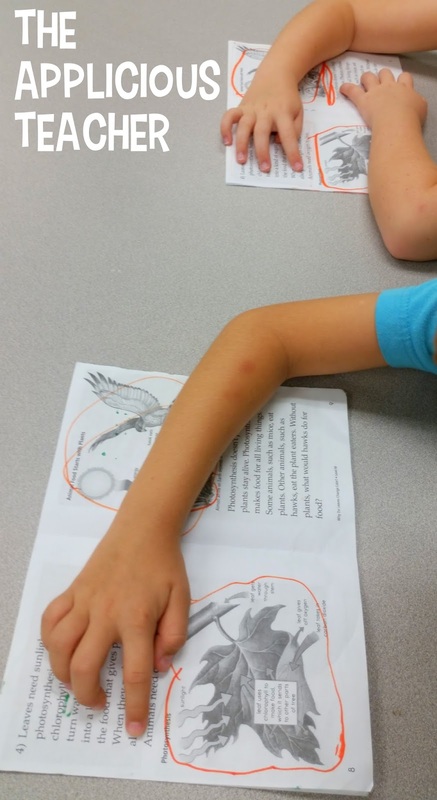 Knowing our author’s purpose seemed a breeze, but finding evidence?! YIKES! Many of my friends wanted to copy easy to find information from captions and charts, and although those pieces helped the text along, they didn’t always match our author’s purpose. As we reviewed each student’s answer, I ended up having to hand back a few sticky notes to have students make adjustments. Don’t worry, we’ll continue working on author’s purpose for the rest of the year! 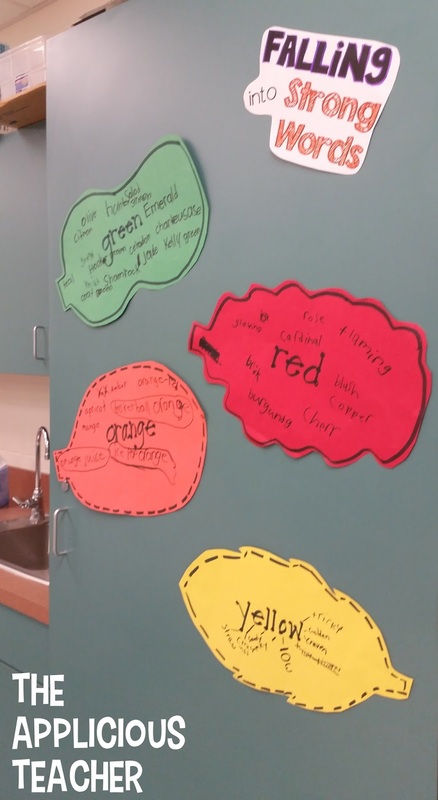 So, then we decided to think of some more vivid words for those fall colors! To complete this activity, I split my students into groups of 3-4. 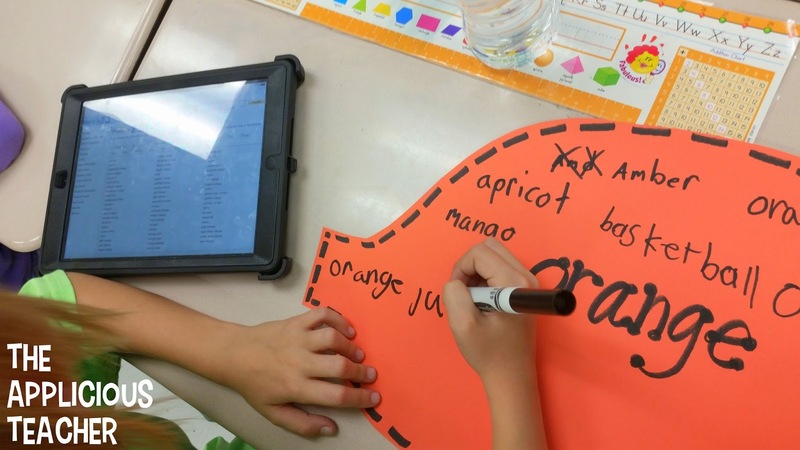 Each group got a leaf, a color word, black marker, and an IPad. We used the IPads to look up more intense version of our color word. After we shared our words, I hung up our charts onto the back cabinets so we could refer to them through out the week while we wrote! For writing, we have dived into Persuasive writing. At first, this genre was a little tricky for my students to grasp, but once we understood that sometimes authors write to get us to think a certain way, it was a WHOLE lotta easier! To start our persuasive writing for the week, I read the story, “Twas the Night Before Thanksgiving”. If you don’t have access to the book, there is a great little video on YouTube. If you’re not familiar with this story, it is SUPER cute! A class visits a turkey farm right before Thanksgiving and befriends all the cute plump turkeys. Upon learning their new friends’ fate, they hatch a plan and smuggle the turkeys home. Instead of turkey for Thanksgiving you see each child has a turkey as a guest. Precious! 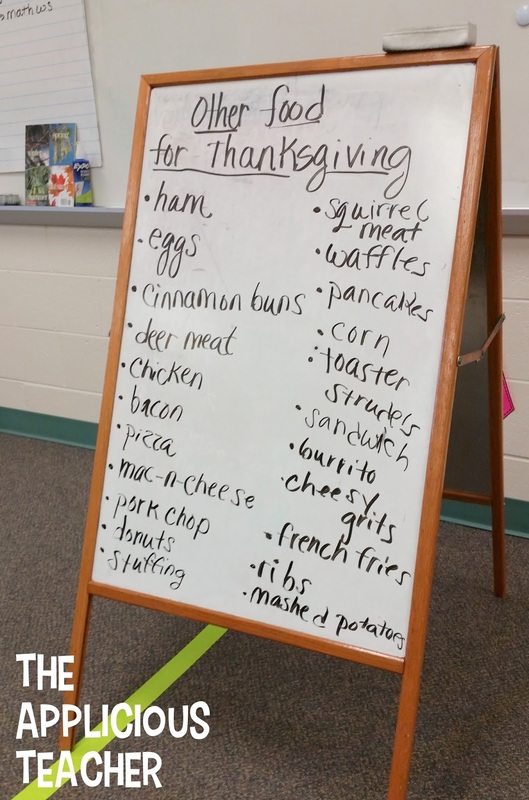 After reading through the text, we started brainstorming what we could have instead of turkey for Thanksgiving. Our suggestions were so interesting! For the record, hunting is VERY popular where I teach, so things like dear meat and squirrel are just an everyday thing. We each chose an item to focus our writings on, then set to work to begin our brainstorms. We brainstormed 3 reasons why our food choice was better than turkey. Then, we used our brainstorms to begin our rough drafts. I modeled for students how I wrote my persuasive writing piece. They used their edited draft to work on their final copy. Once they were done, they could have a buddy reread their writing and work through checking off their rubric. I can’t say enough about using rubrics during writing. 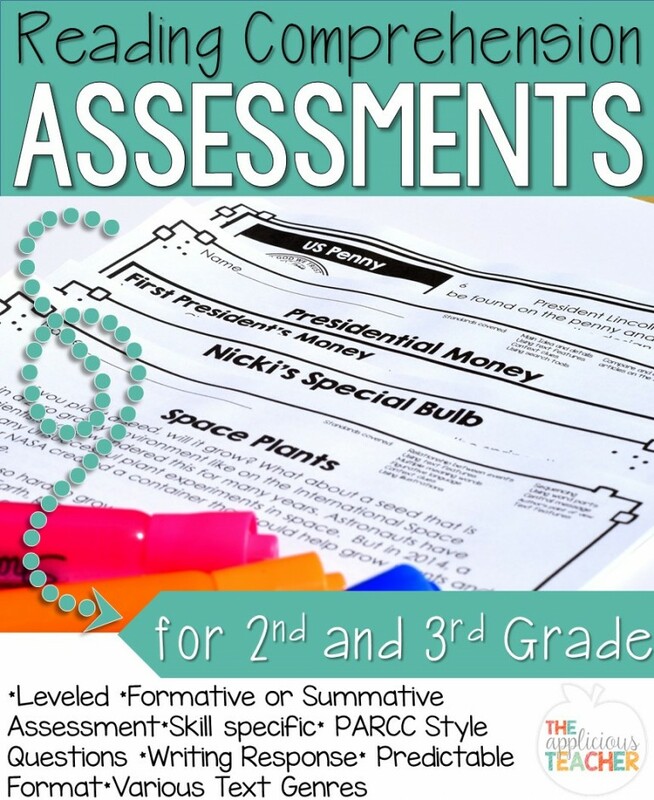 They are a perfect way to communicate what the expectations are for writing as well as a way for you to easily grade each writing piece. Once we were done with our final drafts, we started creating our little turkeys! Their writings turned our great! I used them to decorate our hallway outside our classroom. The kids LOVED showing them off to the other classes as they walked by!